A simple, beautiful stand that helps you get the most use out of your iPad. 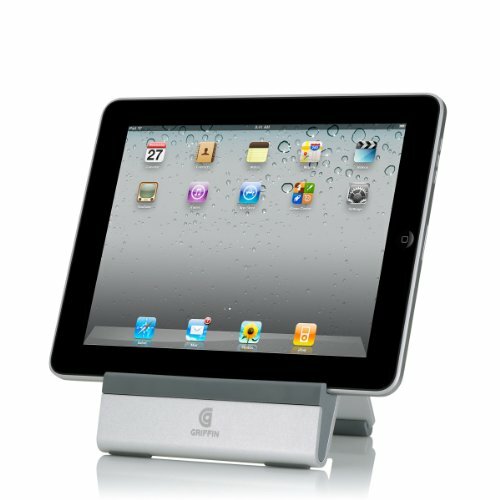 Summary This simple and super sleek Griffin iPad A-Frame Stand is the cool way to hold your iPad. Move it to stand upright in a portrait or landscape view or place it lying down with a slight slant so it's easy to work and play on. The choice is all yours! Manufacturers Description The heavy aluminum stand swings open to hold your iPad upright, in either portrait or landscape view ... perfect for watching video, or viewing pictures. Or close the legs and lay the stand down to hold your iPad at the perfect angle to use it on a desk or for table-top surfing, reading or gaming. Soft silicone cradles your iPad and accommodates the iPad's dock/sync cable. Designed to accommodate Griffin's flexible and hard-shell cases and many others.Simple, beautiful table and desktop stand for your iPad. Use upright or at a lower, wrist-friendly angle.